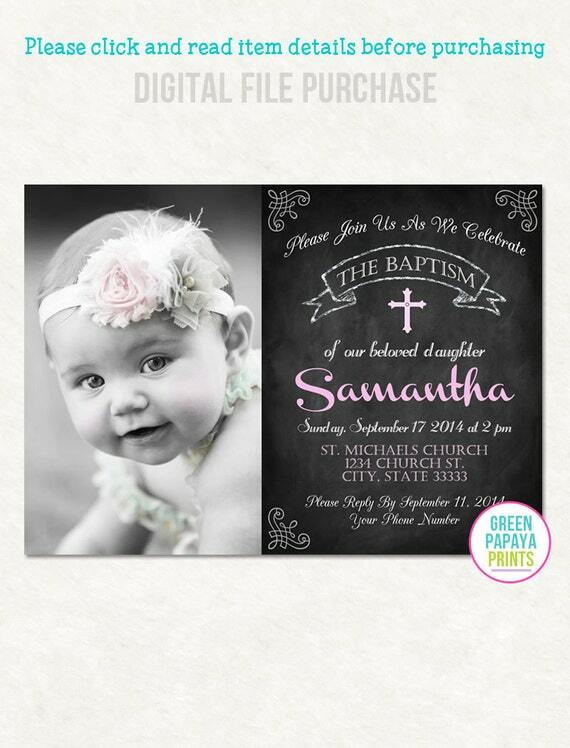 This is a printable Girl's Baptism Invitation. Chalkboard style with pink and white color scheme. It can be customized for dedication, communion, etc. You may also add the god parent's names. You can print this file at home, photo printer or print shop of your choice. You will receive a high resolution 300 DPI JPG file. PDF available upon request. Please email a HIGH RESOLUTION 300 dpi photo to greenpapayaprints@gmail.com or attach to an Etsy convo. Your invitation will be sent to your email print ready within 24 hours! Due to the nature of this purchase, YOU MAY NOT RETURN or BE REFUNDED for this item. By purchasing this item you agree that you have fully read this listing and our shop policies.